Today we’re pitting two proxy service providers against each other to find out which one of them offers better residential proxies. This comparison will provide analysis on some of the most important characteristics of both of these services including a number of IPs, locations, performance, and more. So without further ado, let’s begin our Storm Proxies and Smartproxy comparison review. 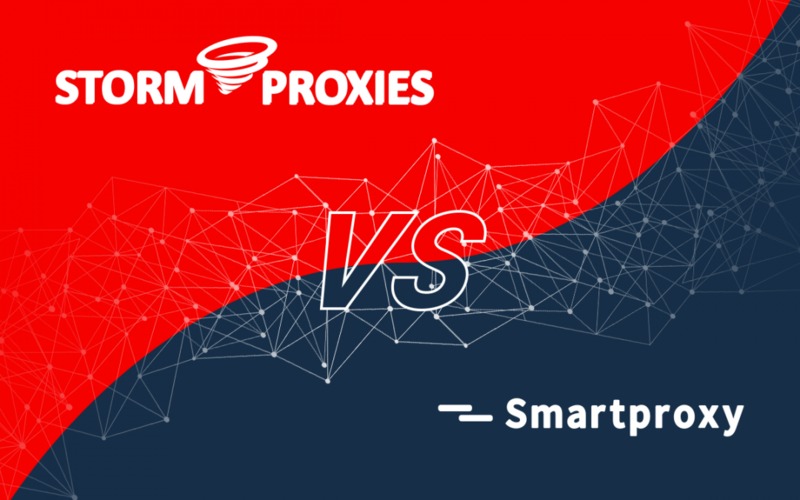 One of the biggest differences between Storm Proxies and Smartproxy is the size of the IP pool. Smartproxy has more than 10 million residential proxies, whereas Storm Proxies has only 40,000 residential IPs. Their pool looks even smaller when we look at the list of supported locations. While Smartproxy offers proxies from 195 countries, Storm Proxies provides only U.S. and EU IPs. Like the most top residential proxy providers, Smartproxy offers limited traffic while Storm Proxies offers an unlimited one. If a provider offers unlimited traffic, it usually means that their infrastructure is poor and you should expect lots of server errors and timeouts. We’ll see if that’s true a bit later. For now, let’s continue with feature comparison. Authorization method: both Storm Proxies and Smartproxy have whitelisted IPs as an authorization method. However, Storm Proxies allows to whitelist only one IP address (we found that a bit disappointing). With Smartproxy, you can also use credentials. Both proxy providers have the session control feature. With Storm Proxies, you can hold the same IP on the same port for a certain period of time (but you can’t set a specific time yourself). 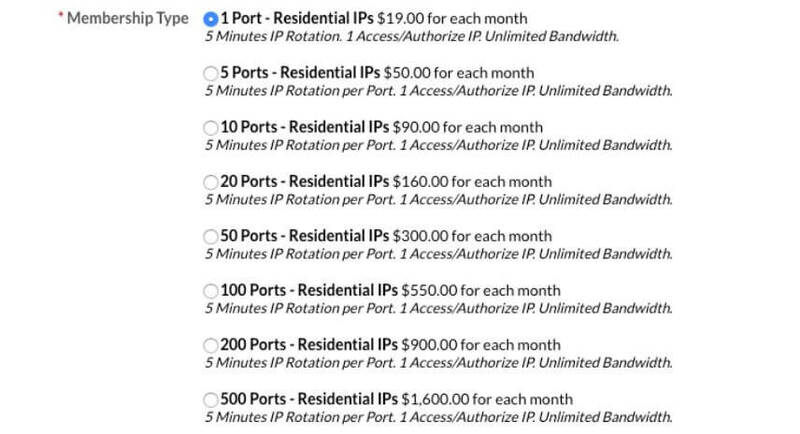 With Smartproxy, you can use sticky gateways to hold the same IP for ten minutes on one port. When using Smartproxy, you’ll be able to create a limited number of users. No additional users can be created while using Storm Proxies. Also, Storm Proxies supports only HTTP protocol, whereas Smartproxy has HTTP and HTTPS. Both Storm Proxies and Smartproxy have similar filtering options – you can only filter proxies by location. However, when it comes to dashboards, Smartproxy can offer more features, including renewing your plan directly in the dashboard. As for customer support, Smarproxy team does a great job answering questions in real time via live chat. To reach Storm Proxies customer support you have to fill out a form on their website. Even though they replied within an hour, we found the whole process a bit outdated. We gave the overall rating of 7.7 to Storm Proxies and a 8.7 to Smartproxy. However, the feature comparison doesn’t give a full overview of the two proxy providers. Let’s see how their proxies performed in real life and, if you want to dig even deeper, you can always read our Storm Proxies review and Smartproxy review. As mentioned before, Storm Proxies offers unlimited traffic which is usually a sign of slow and unstable proxies. As you can see in the graph above, this is exactly the case with Storm Proxies. Their success rate is low, and the number of blocked IPs is high. While Smartproxy is beating the industry’s average in all categories, Storm Proxies is struggling with success rate and the number of blocked IPs. So, it’s no surprise that Smartproxy wins in every category over Storm Proxies. 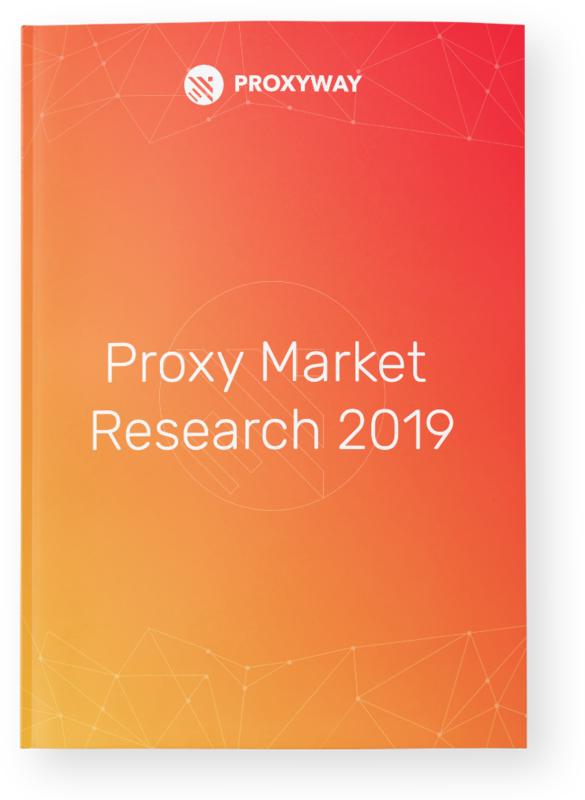 Although Smartproxy has a better overall success rate, Storm Proxies shows slightly better results with targets such as Aliexpress, Amazon, and Facebook. However, with Google and Yandex, Storm Proxies has extremely low success rates and is nowhere close to the industry’s average. Whereas Smartproxy goes over the industry’s average in every single case. 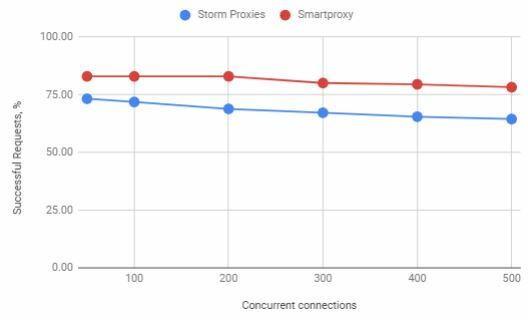 Smartproxy did a better job than Storm Proxies during the concurrent connection test when we put the proxies on a big load by gradually increasing the number of concurrent connections. The success rate of Smartproxy’s residential proxies remained almost the same during the whole test. Storm Proxies went down from the very beginning and continued to drop till the end. You can find the full Storm Proxies and Smartproxy concurrent connection tables at their full reviews. Both Storm Proxies and Smartproxy have residential proxies that are much faster than the industry’s average. 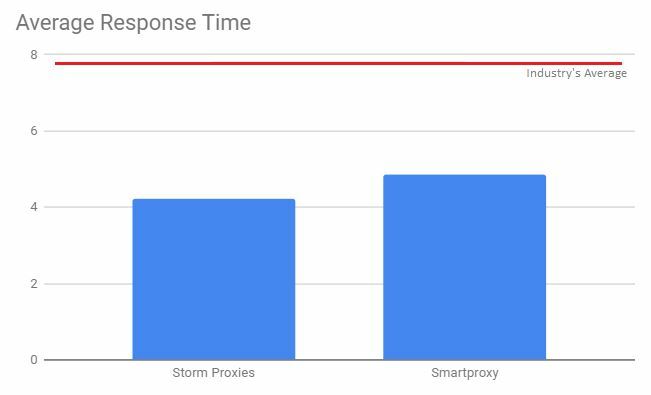 In fact, Storm Proxies has the industry’s best average response time, but Smartproxy’s proxies are also very fast. Storm Proxies offers four pricing plans and doesn’t charge per GB, but rather per port. The price depends on how many ports you want to have. 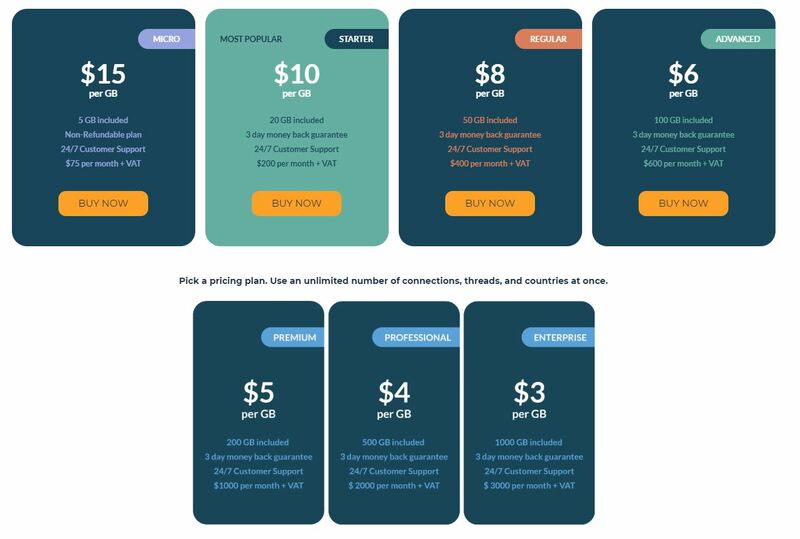 Smartproxy offers pricing plans per GB, which means that your price will depend on the amount of traffic you will be using. Why Smartproxy is Better Than Storm Proxies? Although Storm Proxies has extremely fast proxies, Smartproxy proxies offer much better performance. Smartproxy has a high success rate, and their proxies are almost as fast as Storm Proxies. Moreover, Smartproxy has more useful features and better customer support. So, it’s safe to say that Smartproxy is the better residential proxy provider. Check out their full review here to see a more detailed analysis of their proxies.